The fun part about being a food blogger that you don’t always see is how many times a recipe is tested before it makes it onto a blogger’s website. Thankfully I don’t find myself remaking recipes multiple times often, but these biscuits were not the case. The biscuits shown in these pics were my third attempt. I was ready to give up on them, but thankfully they turned out perfect. The first two batches tasted delicious but the shape and form was questionable. Thankfully take three was a success. The irony of that is that I was so sick of eating biscuits after the third batch that I wasn’t up for baking them again to enjoy at Thanksgiving. Sorry fam. I promise they were delicious. Preheat the oven to 450 degrees and grease your cast iron skillet. In a bowl, combine the milk and white vinegar and set aside. In a larger bowl, combine your flour, cheese, dried rosemary, garlic powder, baking powder, sugar, and salt. Add in cubes of butter and work the mixture with your hands until a crumble forms. Add in the milk and vinegar mixture and form into a dough ball. Sprinkle flour over your counter for rolling out the dough. Place your dough ball on the counter and roll out until it is about 1” thick. Cut out biscuits using a biscuit cutter or a glass*. 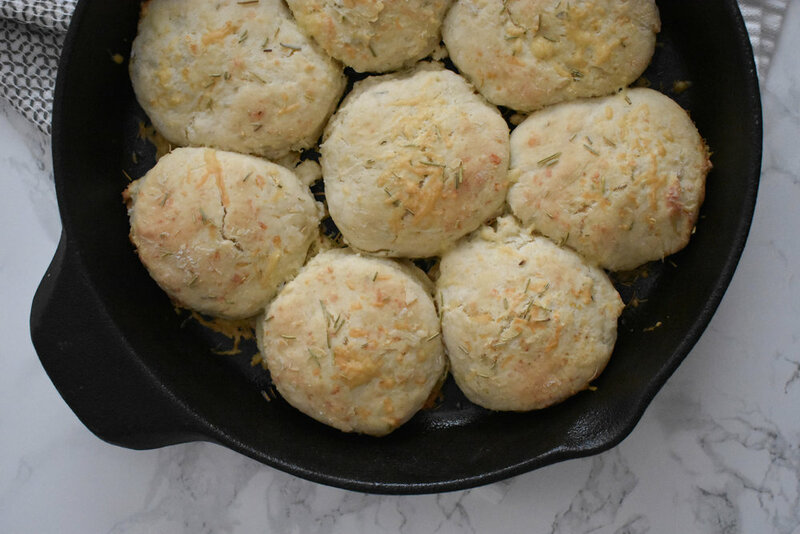 Place your biscuits into your cast iron skillet. Sprinkle with additional shredded cheese and dried rosemary if desired. Bake in your oven for 15 minutes, or until the tops of your biscuits are golden brown. *If you use a glass to cut your biscuits, be sure to spray the glass with non-stick spray before beginning.